So continuing with my rundown of the Scottsdale trip, I’d like to speak a little bit about hiking in the desert. So yesterday before our flight, we decided to take a quick rendevous a mile from our hotel to hike Camelback Mountain. Not sure what I was expecting here, being that we were literally hiking in the desert, but I smartly decide that I’ll just leave my water in the car and that I won’t need it. I’m here picturing we are going to be hiking something in line with Great Falls, MD. Um, no. This was no walk in the park kids. Quite the contrary. More like a climb in the desert. So naturally I leave my water in the car, figuring I can just bum everyone else’s water while we are out there if needed. We start the ascent. By we, I mean Hung, Linda, and Stephen. Hung and Linda, since you probably don’t know who I’m referring to here, are dating. Another great couple, another rarity but they are just a pleasure to be around pretty much at all times. Hung, if you may recall before, was one of my first and closest friends in DC. Pretty hysterical dude. All the more hysterical hanging out with him all weekend, but I’ll get to that. Stephen and I, while we did sleep in the same bed together all weekend, are not dating, despite contrary belief (this I so kindly relayed to the large, hideous woman predator at the wedding so that Stephen was fair game). Anyway, it was basically the four of us hanging out all weekend…the fab four stayed together at good old Camelback Inn. So yes, we start the climb. I’m out of breathe within a few minutes, and at this point we are only climbing some stairs. Then – disaster strikes. I see a pretty steep climb ahead. Being that I’m pretty terrified of heights, everyone passes me while I stand there staring at it all freaked out. Mind you, there is a handrail to the left which would have allowed me to more easily make the climb, but naturally, I think about how many people have touched that handrail. Given that it hasn’t rained in 70 days in Scottsdale, I figure it’s pretty dirty. So I decide to be a little more daring and climb the rock. Bad move. Pretty soon I’m laying flat on the rock and trying to figure out how the heck I’m going to make it back to the handrail for safety without falling, germs or no germs. Hung is next to me jumping around like a spider and trying to coax me out of it. At this point, I valued my life over touching a dirty handrail, so decide it’s in my best interest to use the thing. I eventually made it over to the handrail without tumbling to my death, which was a nice bonus. So I make it to the top of that minor juncture. I would say the rest was smooth sailing, but that would be a lie. On the rest of the ascent, a few things happen. One is that every so often we will see some crazy shirtless dude running by, hurtling rocks and jumping across ledges, pretty much looking for a death wish. Are these people insane? Hung, being the thrill-seeker that he is, decides that he’d like to try this too. Mind you, he is not wearing the proper equipment for this and is also carrying a large SLR camera. He really looks like a rock climber in this particular getup. Next thing I know, Hung and Stephen are risking their own lives climbing this huge random rock off the beaten path. I seriously feared for their death, on a few ocassions. Hung also decides on the descent down that he’d like to run every so often, like these insane shirtless dudes. He honestly cracks me up. On the trip I also learned that Hung has zero sense of direction and considers anything west of Ohio the “midwest.” Arizona – midwest. California – midwest. Interesting. Back to hiking, the rest of the climb was not as bad as the first handrail incident. But it was just an amazing workout with simply breathtaking views. I wished I had my camera with me, but luckily Hung had the SLR and didn’t fall off a cliff or anything (came close a few times), so we at least have his pics. It was termed an intermediate to difficult hike. I would have to agree with that, especially after Linda and I saw a guy who had fallen and ripped his pants off to the point of us being able to see his underwear, with a huge gash that clearly required stitches on his shin. Poor guy. He was in good spirits though. Probably counting his blessing that he didn’t fall off the mountain and die. So some other adventures on the way up. Let me first preface this by saying people out west are far friendlier than anyone in DC. As you may recall, UConn pulled off a nice upset victory against Notre Dame over the weekend (go Huskies!!!) and I was wearing my UConn shirt. Got a bunch of congratulatory comments from lots of people about that, as if I had played in the game. Nevertheless, I accepted the congratulations gratiously. So Stephen and I are up front (Linda was barely tagging along with us so Hung hung back with her to help her along), and this one nice guy just comes up to me and asks if I want some water! This was perfect since Stephen was not sharing his for some odd reason (pretty sure he wanted to kill me) and Linda and Hung’s bottles were virtually empty at this point. This dude was a gold mine, and so friendly. The guy apparently knows idiots like me don’t think that they need water rock climbing in the desert, so carries an additional couple of liters on him to help others out. I guess he’d rather not see people dying of dehydration, nice guy. He proceeds to tell us a story about how a few years ago, he gave some water out on the mountain to this rock group, and didn’t know who they were. Ended up they were so appreciative of the water that they offered him backstage passes and front row seats to their next show. Can we say Talking Heads?!?! That’s how great this guy was…even Talking Heads appreciated the magnitude of what he was doing. Goldmine. That is how we felt as well. I honestly may have died of dehydration if I didn’t run into this guy, since Stephen didn’t want to give me any. Hung eventually caught up with us and got in on the deal, and we asked dude that if he saw Linda on his way down to offer her some water too, so she was able to get some too we later discovered. Amazing. It’s nice to run into some kindhearted souls every once in a while…guess it just happens more frequently anywhere but the east coast. We make it to the top. Views were just stunning. At first it was only Hung, Stephen, and I. We didn’t think Linda would make it. But, sure enough, the three of us are standing around taking pictures with Hung’s SLR, and who emerges? Linda! I had the SLR at the time so snapped the classic shot of her straggling up over the ledge. That may have been the best moment of the trip. We all made it! Stephen got a littttle too close to the edge at one point when Hung was taking a picture, slipped a bit trying to freak me out but just ended up freaking out everyone near him…everyone gasped. I thought we’d lose him and had to vacate the scene because I was getting too scared. Clearly I was not getting anywhere near that ledge, picture or not. We were pretty damn high up. So overall, difficult climb, great workout, great meeting people on the way up and down, good times overall. I am pretty damn sore today and it was so tough to leave after having such a great weekend. I’d have to say the hike pretty much capped out the trip on a great note. Well, that and maybe the stop at In-n-Out Burger on the way to the airport. That’s some good stuff right there, might even beat out the McDonald’s two cheeseburger meal. That or it’s a close second. Unfortunately I don’t have any pics yet of Camelback Mountain, but will post if ever received from Hung. 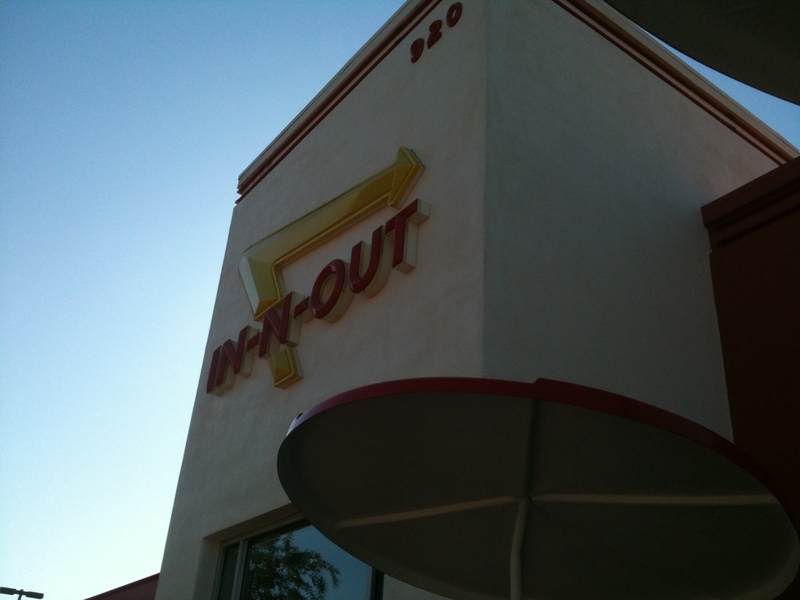 I do, however, have a pic of the In-n-Out we stopped at!